Did you know you can speak at least one word of the virtually extinct Proto-Bulgarian language? Yoghurt means “firm-set milk” and it was the Bulgarians who discovered it. More than 1,300 years ago the people in the region of today’s Bulgaria were making “Katuk” from sheep’s and buffalo milk. Today scientists speak of Lactobacillus bulgaricus and by this mean the natural equivalent of the probiotic dairy products produced and marketed in Europe at a cost of tens of millions. The healthy secret of Bulgarian yoghurt was discovered exactly 100 years ago by the doctor Stamen Grigorov. The physician localised the special lactic acid bacteria Lactobacillus bulgaricus, which can evidently only “work” best in the Bulgarian climate. A scientific team from the Stara Zagora University is also currently working on this: they are researching the original strains of the highly active nutritious Lactobacillus bulgaricus in Bulgarian mountain villages where an exceptionally high number of the inhabitants reach 100 years of age and more. Traditionally unsurpassed is the description of what the Bulgarians make from and with sheep’s cheese: From mildly aromatic to seasoned and strong and simply different, there is something for every taste. As hard, soft cheese or cheese spread, traditionally on and with bread, with main courses, as a dessert cheese, grated on salad or with “French fries” – the creative variations know no culinary boundaries. And Bulgarian cow’s milk cheese – especially the hard cheese speciality “Kashkaval” and the full-bodied aromatic “Lacrima” – are increasingly being imported to Western Europe too. Bulgaria, the home of the buffalo..!? Hard to believe for the layman but true: for the natural feeding conditions for these gentle giants are ideal in the rural regions of Bulgaria. Here the animals eat – more or less as a sideline– for rural conservation and meticulously graze the meadows and pastures of the region. From spring to autumn the buffalo eat only fresh grass, meadow and wild herbs and even thistles, nettles and reeds are eaten with great gusto. In winter, which the animals also spend outside, in addition to hay they are given by-products (marc) from the apple-growers. A delicacy which causes the otherwise so relaxed animals to virtually gallop to the trough. 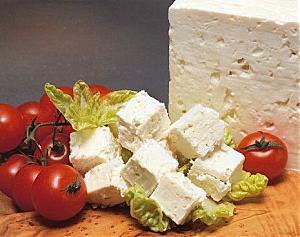 In Bulgaria’s buffalo farms, production of hard buffalo cheese, buffalo “feta” and also buffalo yoghurt predominates. Ingredients: 3-4 tomatoes, 1 cucumber, 4-5 cored, roasted and peeled capsicums, 1 onion, 150 g (ideally Bulgarian) sheep’s cheese, parsley, vinegar, oil and salt. Chop the tomatoes, cucumber, capsicums and onion and season with oil, vinegar and salt. Then grate the cheese over the salad and sprinkle finely chopped parsley on your Shopska.